As you might remember, almost exactly a year ago I posted about the Tarta de Santiago, a wonderful almond cake from Spain. I was contacted a few months ago by Food52, one of my favourite recipe sites, asking if I would write about the recipe for their Small Batch column this summer. So if you'd like to read a bit more about the cake or would like to see the new step-by-step photos, then I recommend you head over to Food52. That Toscakaka is my showoff cake these days. Much better than a fancy iced cake - people don't expect much from it but are always blown away. Thankyou! I saw the feature on Food52, congratulations! 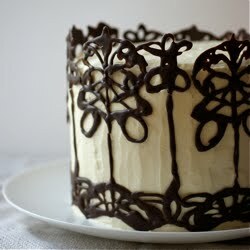 This is a wonderful cake and I was so happy to see your feature on the site. Glad to hear you're still loving it! I was thinking the other day that it's a great cake for this heat - any icing would be melting all over the place if it had to stand or be transported whereas it would be fine. Ooooh how exciting! Congratulations! Can't wait to read it. It really is. Hope you're adjusting to being back - the post-holiday blues hit me this morning! Thanks Suzanne, I was really touched to be asked. Congratulations on your contribution to Food52! Very exciting! The Toscakaka looks divine ... can't wait to try it! Are you using Lakeland pushpans? If so, how are you finding them? I made the Tarta de Santiago last year with my mother, and the whole family loved it so much we made 2 more in the same month. Yesterday I tried the Toscakaka, which I like even better! I'm taking the rest of it to share with the family later today. Both cakes were so easy to put together but so impressive to look at and to taste; thanks for sharing. I made the toscakaka the first time i saw your post and we all loved it. It is a wonderful, tasty cake. Congratulations, i will make sure to follow it. You and Emma have some of my favourite food blogs. Hehe, oh dear! I think that happened to my mum once too. Glad it looked dramatic anyway. Thanks Mari! I hope you do try it - it's one of my favourites. Thanks! I love both cakes - simple but so delicious. Nope, I used an Alan Silverwood loose bottomed tin for the tarta and a different brand I can't remember for the Toscakaka - it's quite a thick, heavy duty black loose bottomed tin. I'm so pleased you liked them both! Thanks for letting me know, I love hearing how things go. That's brilliant, thanks for telling me!